In Texas and other U.S. states, opposition is growing against a proposed pipeline to transport heavy crude oil from the Canadian tar sands to refineries along the coast of the Gulf of Mexico. Proponents of the Keystone XL project see economic growth, critics fear an oil spill and warn of pollution. Wooden markers have been placed on the forested land of David Daniel in Winnsboro, a Texas town about 150 kilometers east of Dallas. All trees in a strip 36 meters (120 feet) wide will be cut down against his will, Daniel says during a walk on his 8 hectare (20 acre) property. Everything between the posts, up to the tallest cedars, has to make way for the construction of an underground oil pipeline. 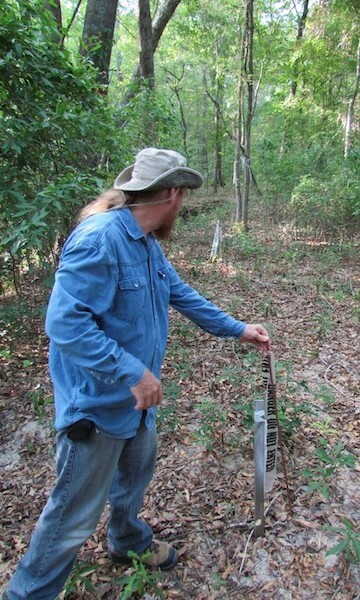 David Daniel, founder of Stop Tarsands Oil Pipeline, shows markers on his land in Winnsboro, Texas, indicating the route of the proposed Keystone XL pipeline. The markers indicate the route of Keystone XL, a planned mega pipeline to transport oil to the refineries on the Texas coast of the Gulf of Mexico, the largest refining centre in North America. The crude that is to flow under Daniel’s land will come from the tar sands in western Canada, by far the largest oil reserve on the continent. The link is to be constructed and managed by the TransCanada pipeline company. The 2,700 kilometer pipeline crossing through six states has set off a fierce debate about the future of energy supply in the United States and the role of the controversial tar sands, one of the world’s largest reserves. The project is ready to go ahead as soon as President Barack Obama gives the final green light. A decision about the $7 billion investment is expected this year, following public consultations that have been held since 2008. Many consider Obama’s choice on the project to be one between economic growth and energy security on one side, and environmental protection on the other. On the one hand, the project to double the existing U.S. import capacity of tar sands oil to 1.1 million barrels per day would create tens of thousands of jobs, according to proponents of the pipeline – a tempting prospect for Obama, whose approval ratings have been falling due to the ongoing economic crisis and high unemployment. Moreover, proponents of the pipeline argue that increasing oil supply from Canada would reduce U.S. dependence on oil from the Middle East and other areas of geopolitical risk. Obama has designated Canada, which already accounts for over 20 per cent of American daily imports of 11 million barrels, as a stable and predictable energy source for the future. But on the other hand, a presidential go-ahead for Keystone XL would imply ratification by Obama of growing exploitation of the tar sands. Environmental groups see this as a big step in the wrong direction. They point to the strenuous production process of oil from the tar sands as a major source of greenhouse gas emissions and pollution. Relying more on tar sands oil would fly in the face of Obama’s promise to focus on clean energy, they argue. For that reason, Keystone XL has become the focal point of a fierce campaign by opponents of the oil sands. This month, demonstrations are held in Washington calling on the Obama administration to reject the project. “If you want to impact the tar sands, you start right here by cutting off the transportation,” says Daniel, who has founded the group Stop Tarsands Oil Pipelines. It’s a tough fight, because proponents of Keystone XL point to the advantages of the link with equal conviction. Heavy oil from the tar sands – known as ‘bitumen’, a material that is left after the viscous crude is chemically separated from sand and clay – is particularly suitable for the refineries on the Gulf of Mexico, which are built to handle heavy crudes from Mexico and Venezuela, two source countries that are in decline. Still, no one is pushing harder for the connection than Canada’s oil sands sector. Operators in the tar sands want better access to markets to keep up with anticipated strong growth in production. Current daily production of 1.6 million barrels per day is expected to rise to 3.7 million barrels by 2025. Large oil producers like Shell, ExxonMobil, BP and Total are investing billions of dollars in oil sands operations, mostly to offset declining production from conventional sources elsewhere. Refinery near Port Arthur in Texas, along the coast of the Gulf of Mexico. Besides refining capacity, the industry in Port Arthur on the Texas coast, a two-hour drive east of Houston, offers access to a deep sea port. The landlocked tar sands, located in the Canadian prairie province of Alberta, desperately need an outlet to world markets. Keystone XL would give the tar sands, now exploited primarily for the Canadian market and the U.S. Midwest, access to other parts of the world, including Europe and China. In addition to pollution from production, environmental risks are also posed by the transport of crude from the tar sands, say critics. Bitumen is more viscous than conventional crude; in order to send it through the pipeline it must be diluted to a compound called ‘diluted bitumen’, or ‘dilbit’. This mixture, which contains sand particles, will be squeezed through the pipe under greater pressure and at higher temperatures than conventional oil – with greater risk of a leak, say opponents. Brenda Kenny of the Canadian Energy Pipeline Association, an organization of pipeline companies, denies that transport of dilbit is more dangerous. “There is absolutely no indication that pipelines transporting blended crude with bitumen have any sort of increased risk of safety issues or internal corrosion.” Thanks in part to modern technology to inspect pipelines from the inside, carrying crude by pipeline is “by far the most environmentally sound and safest way to move large quantities of oil,” she says. But in Winnsboro, David Daniel and other landowners have little faith in the good intentions of TransCanada and the oil industry. Oil spills like those in Michigan and the BP spill in the Gulf of Mexico have sown deep doubts. People are especially worried about the damage a leak could do to the supply of drinking water. “Our drinking water is of greater national interest than this oil,” says Daniel. Megatanks in the town of Nederland, Texas, the end point of the proposed Keystone XL pipeline. Still, Texas also has many proponents of the pipeline project. The town of Nederland, which neighbours the Port Arthur refining centre, is to be the terminus of the Keystone XL pipeline. 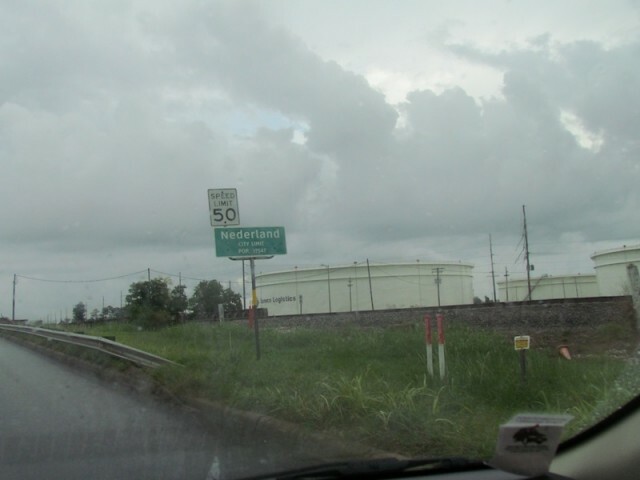 Nederland, Texas, is dominated by dozens of huge tanks, where crude oil is stored for delivery to big refineries of Valero, Shell, Total and others. The town was founded by Dutch immigrants in the late nineteenth century. It has 18,000 inhabitants and looks prosperous. Purchasing 10 AK-47s will be a red flag Austin wants to re-establish Formula One in U.S.